It’s sad that I have put off this easy upcycle for so long. I have been living with this cheap melamine cube bookcase in my craft corner for about 6 years now. It had feet on it once, but then the whole things started to sag, so I took the feet off and let it just be awful! It served a purpose of very poorly organizing loads of crafting clutter. But was such an eyesore. Not anymore! 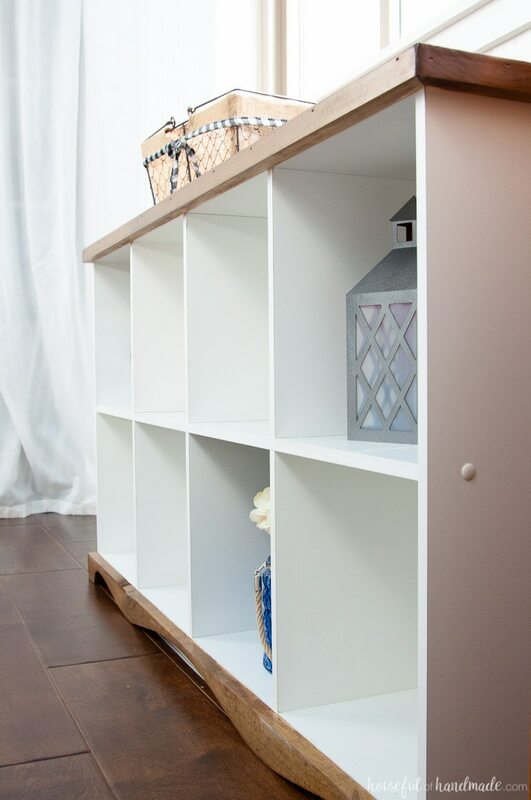 With just $5.5o I transformed the cheap cube bookcase into a wonderful Farmhouse Console Table DIY. I am starting to be really happy I never threw out the inexpensive bookcases that were the beginnings of our home decor back when we were young. They moved from apartment to apartment and to our home. Then as we replaced them with “real” furniture, were shoved in the corners of our basement. While they are useful for organizing and storing lots of stuff that comes with kids, they are not pretty. But with just a few simple additions and an afternoon of work, you can transform them into something really wondeful! After transforming the basic bookcases into my fantastic rolling work table, I was excited to transform the white cube bookcase too. A console table would be perfect under the large window in my new office & craft room. 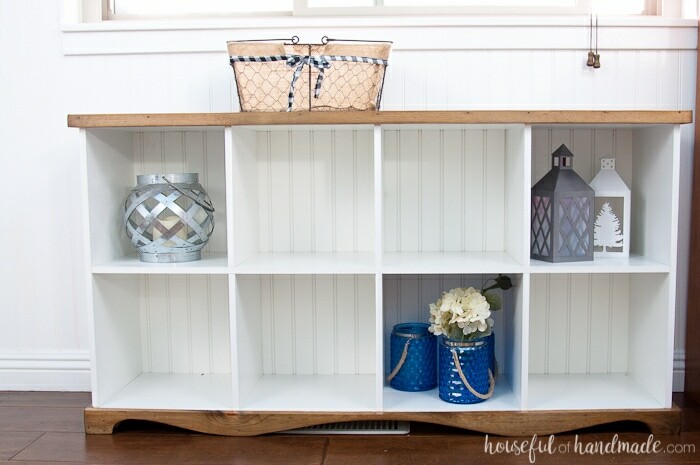 So, I decided to upcycle the unloved bookcase into a simple farmhouse console table DIY. 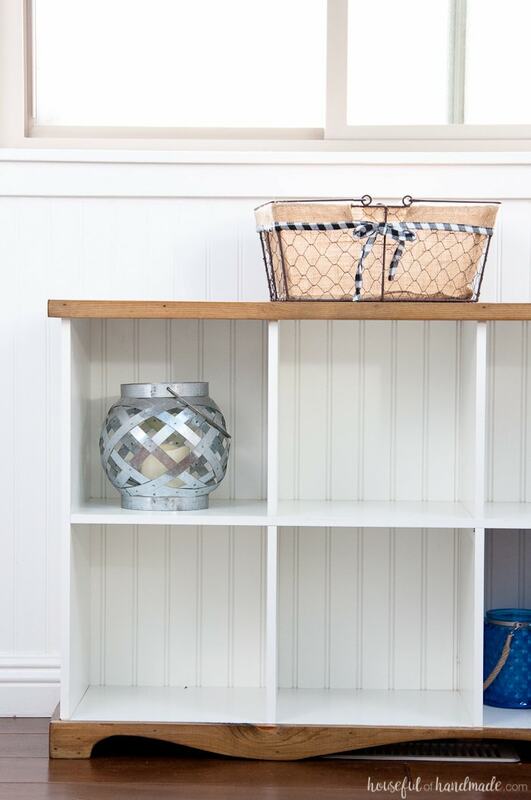 Now it’s the perfect place to store some of my favorite crafting and decorating treasures. If you have been following along this month, you may have seen that I am trying to completely transform my kids old nursery into my new office & craft room for only $100! Yep, I can only spend $100 (but am able to recycle and use things that I already have on hand). 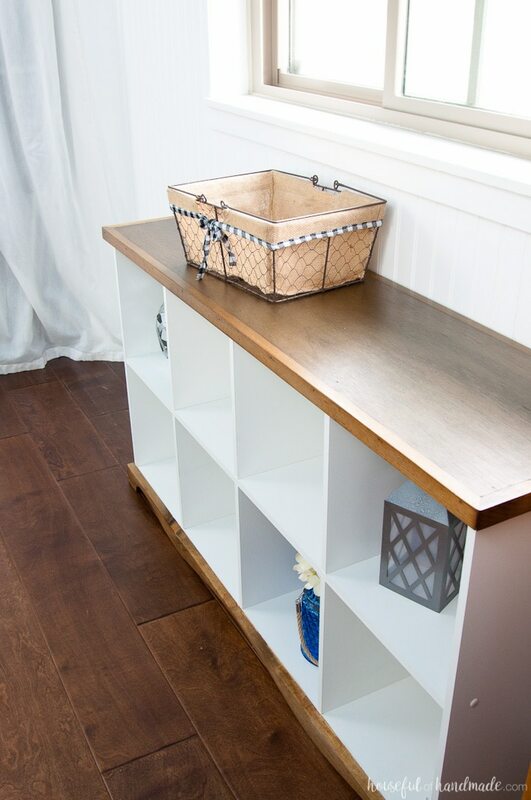 For this farmhouse console table DIY I was able to use a piece of beadboard that was left over from when we originally added beadboard to the room, plywood and stain left over from the closet desk build, and a scrap of wood. Then all I had to do was purchase a 2×2 and a 1×4 board to make this boring bookcase beautiful! Can you believe this transformation cost just $5.50? And it’s a good thing because as we are coming to the last week of the $100 room challenge, my remaining budget is getting really, really small. Make sure to follow along as I finish this room and share the final (super) budget friendly ideas. 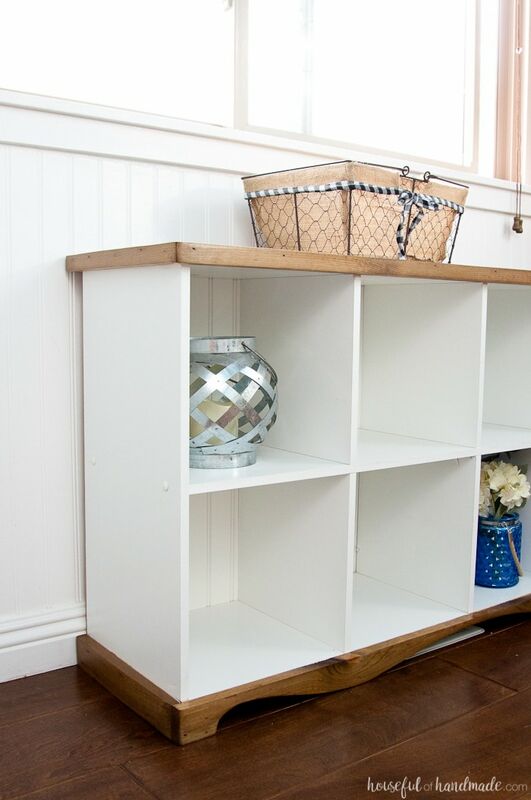 To see how I transformed this old cube bookcase into a farmhouse console table DIY, click the arrow below for the detailed tutorial.